Description: The "Pill" Unit. Right after the new decals were applied. Description: A different paint schem from the standard green whiteface geep. Note the logo on the nose. Description: BNSF GP39E 2911, wearing one of the BNSF's experimental schemes, switches Rochelle Yard. Description: We were in Smithboro for just a few minutes just south of the BNSF/CSXT Crossing. This was worth it, probably the neatest train on the Beardstown Sub. today! This is one of the few Experimental BNSF Painted "Pill" Units. Description: Lots of green still left here. Description: The BNSF engine shop in Willmar. Description: This is one of four experimentally "patched" units done by BNSF early in the merger. There were two BN, a and two SF units, each being slightly different. Description: 3 geeps leads a transfer job. Description: Curiously marked BNSF 2911 sits with its local at the end of the work day in Fremont NE. 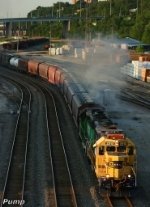 GP38-2 2240 trails. Description: BNSF 2911 and BNSF 2875 sitting in Dodge City, KS. Description: BNSF 2911 sitting in Dodge City, KS. Description: BNSF #2911 is sitting in the yard in Dodge City, KS. Description: BNSF #2875 is sitting in the yard in Dodge City, KS. Description: BNSF #2223 and #2911 are doing some switcing moves in the Dodge City, KS, yard. Description: Ex-ATSF and BN (originally Frisco) power take a transfer past Old Union Depot Interlocking from BNSF Murray Yard to BNSF Argentine Yard. Description: The crew of the transfer freight smokes it up for Mike Mautner and I as they approach the Cesar Chavez Bridge. Description: Two of a kind! Experimental 2911 heads west through Naperville. Description: A BNSF local passes east through Downers Grove. Following right behind is a Metra commuter train. Description: At the BNSF Galesburg Yard where we have the Rare BNSF 2911 (notice nose) and a Newly Painted Yard locomotive!